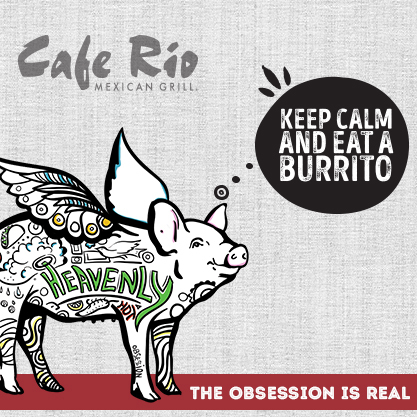 *Friday Favorites, Vernal Day #2 & Mission Accomplished. *Cross Your Fingers for Me + MY NEW FAVORITE RUNNING ADVICE. Well, I haven’t done this since May of 2016—> Sub 90 for the half-marathon and for the majority of the race I was doing a workout and not actually racing (the last 1.1 miles I was DEFINITELY racing though ha). PS the last time I had a sub 90 half-marathon I remember that Andrew told me he loved me for the first time the night before so I remember smiling like crazy that entire race. 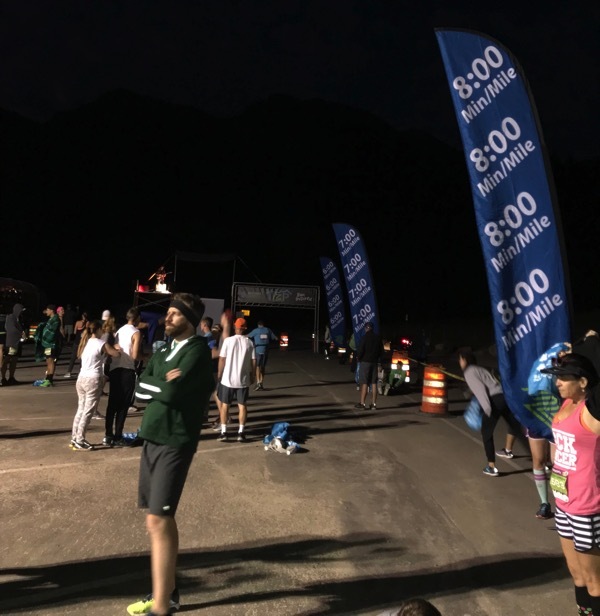 Things started off by waking up at 3:40, getting ready really quick and standing in line for the busses to take us to the starting line in the American Fork Canyon. The craziest thing happened but one of my college roommates ended up being in line right in front of me. 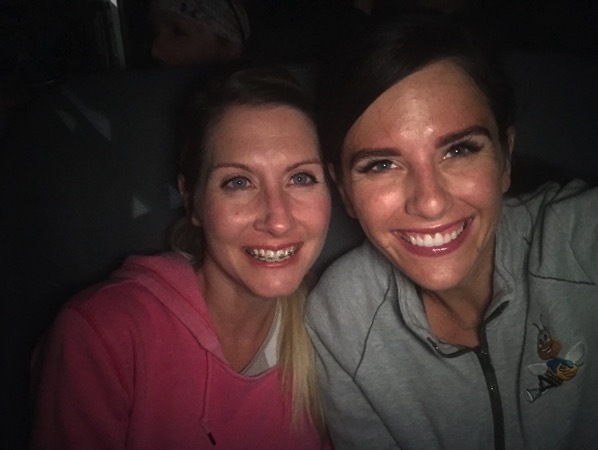 It was so fun to catch up with each other on the bus ride and talk all about the race. I got to the starting line at around 5:10 and walked around for a bit before jumping in line for the porta potty. I. Was. Shivering. 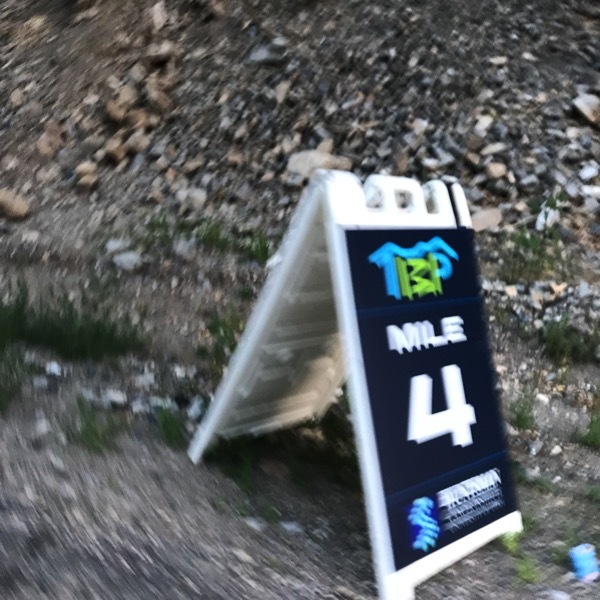 You are up in a canyon next to water at the start which feels terrible as you are waiting but amazing starting at about .3 miles into the race. 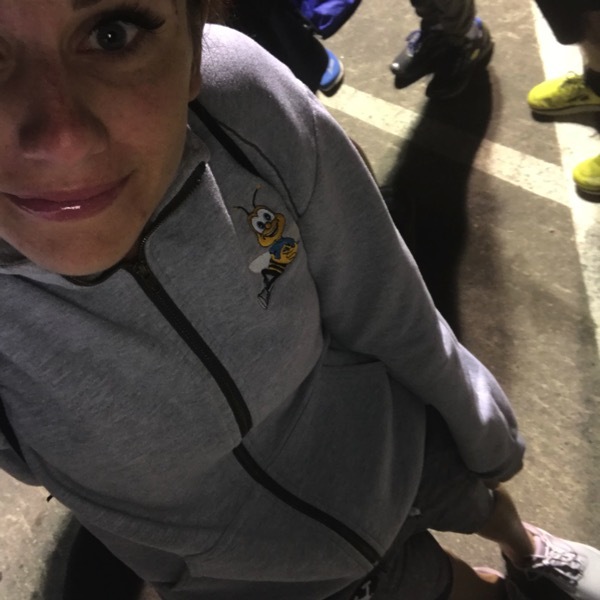 This lucky bee sweatshirt of mine accompanies me on pretty much every race that I do. It is my good luck charm. 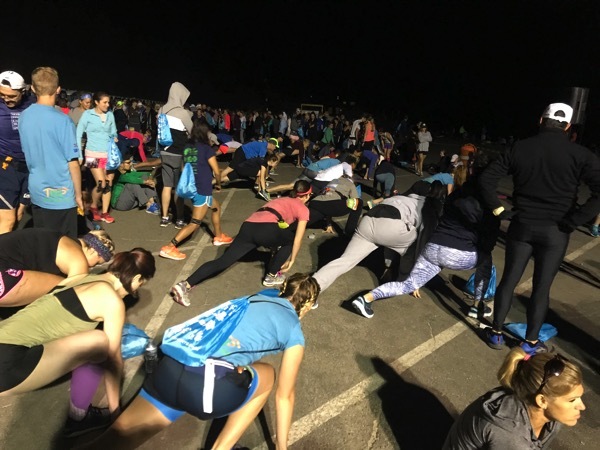 They had some pre-race yoga going on which I should have done to warm up but I wanted to shiver instead. And then I ran into some friends a bit later. We dropped off our bags on the bus and got ready to go. 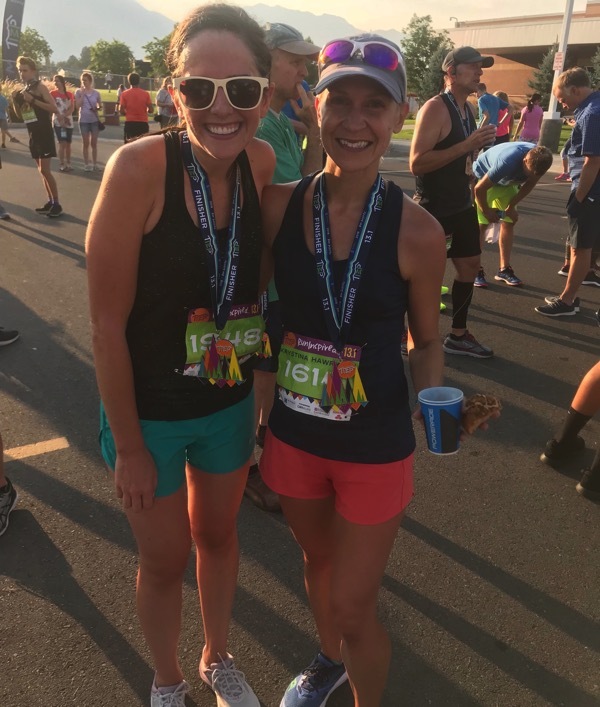 PS the friend on the right with the visor is VERY speedy and also training for St. George so I need to drive to where she runs and chase after her some days. They were all pacing this race! DOUBLE. KNOT. Shoe. Check. <— One of my biggest life pet peeves is my shoes coming untied during a race. I cannot stand this happening so double knots are very important to me. 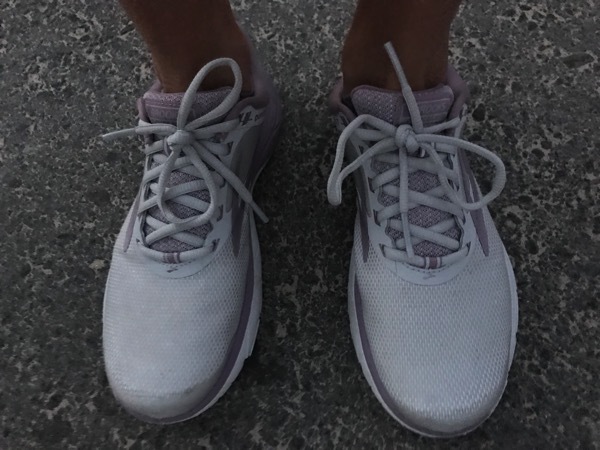 I wore the PureCadence 7 for the race but I’m still not sure if I want to use these for the marathon. I might need a bit more shoe for the marathon but I love how light and fast these feel. They played the National Anthem and about 30 seconds later we were off! It was absolutely gorgeous. The weather felt perfect until about the last 4 miles when I started feeling hot. The first 2 miles were a warm-up and then I started the first 2 mile interval of speed. Each mile is marked really clearly which I always appreciate big time. Between each 2 mile interval of speed I had .5 miles easy. The best part of the entire race—> Seeing my crew and high-fiving Brooke at mile 9. Andrew said that Skye was so happy to see me and started kicking like crazy when I went by. Still no ‘Mama’ talk but I’m still guessing (hoping) that she just calls both Andrew and me Dada because she was saying that when I went by. At around mile 10 things were slippery. The trail was really wet from sprinklers so I tried to be careful there. And then there was a section a bit later where there were fences on both sides of the small trail and HUGE sprinklers going off. There was no avoiding these sprinklers and they kept hitting me hard right in the face. It wasn’t a refreshing sprinkler portion ha… it was like ‘I took a shower and was dripping wet sprinkler’ portion. Not complaining, it just made it feel like an obstacle course race there for a second! At 12 miles my coach told me to go for it and that is what I did and that is when it hurt. Turns out I need to focus on my form when I am feeling tired. I was really leaning back into the stride and my fingers were almost touching my chin but these are both things I can definitely work on and change! But nope, you turned a corner and the finish line was there so it was right on (my watch said 13.16). I was VERY happy after Tuesday’s race that this race was not too short or too long. Hallelujah! The last 1.1 miles definitely felt like a race. I felt very strong up until then but hurt during that last little bit. I was SO lucky because at about mile 12.2 my really good friend Toby was there waiting for me and totally helped me to pick up the pace by chasing after her for about .5 miles. I am very grateful for that because she got me moving a bit more and pushing myself. The race started right on time too! 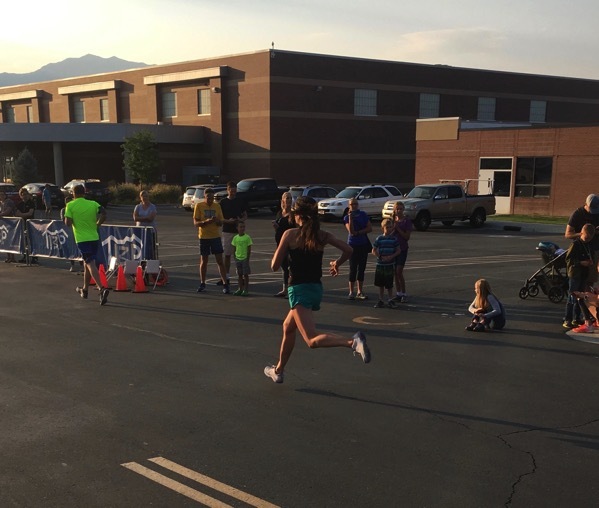 Runtastic always puts on an amazing race so if you are ever in Utah, try one out! My workout was set up to look like this—> 2 mile w/u, 4 x 2 miles fast w/.5 easy after each 2 mile interval, last 1.1 miles fastest, 2 mile cool-down. 7:13, 7:13, 6:44, 6:37, .5 easy, 6:33, 6:37, .5 easy, 6:36, 6:46, .5 easy, 6:40, 6:42, .5 easy, 6:23 and .16 @ 5:55 average. I hung out with my family for about 10 minutes and then did my cool-down at the track. Total mileage for the entire day and elevation loss of 792 feet and elevation gain of 274 feet. This course definitely has more down than up but I’m pretty thrilled with how things felt and went! 15.32 miles @ 6:58 average. The difference between a 6:4something mile and a 6:23 mile was huge from me. I felt very controlled during those 6:40ish miles and that 6:23 BURNED. But compared to my last half marathon 3 months ago, that last 1.1 mile during this race felt like I did for the last 9 miles of that half-marathon at the end of April:) I am definitely noticing improvements and I raced that entire race in April and finished in 1:30:32 with a 6:56 average and Saturday was a hard workout (with the last 1.1 that felt like a race) and finished in 1:29:44. Let’s talk about fuel for a second! After almost ten years of marathoning, I am finally getting my act together. <— That’s kind of ridiculous ha. Before the race I drank my 32 ounce Hydroflask of water, ate a jam sandwich on the bus up. 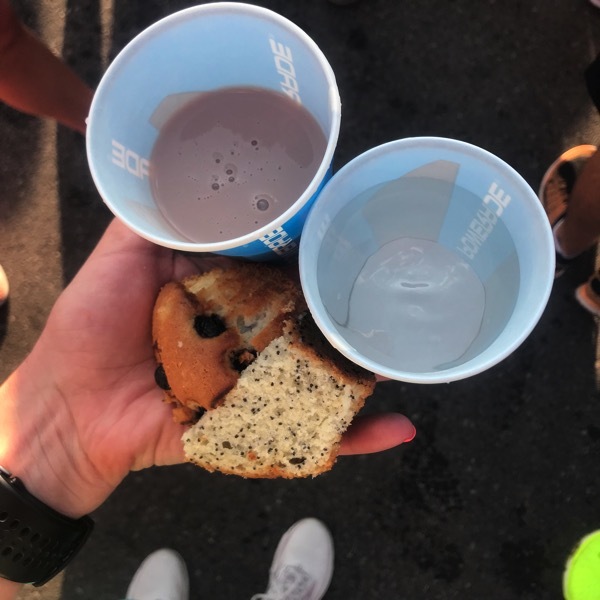 I took my nanohydr8 (I seriously swear by this thing) 10 minutes before the race and then switched off between water and powerade at each aid station. I took a huma gel (my favorite ever) around every 35-40ish minutes. Candice taught me to just take the gels all at once (I used to slowly sip on them) and that has helped me a ton to eat while running. I also practiced taking my gels during the fast miles to get used to taking in calories when I am pushing it (so that is how the marathon will feel) and not feeling like eating. Stacey told me about her idea to use a STRAW during the race to get in liquids (most of the aid stations were during the fast miles too so that was nice to practice). Oh my. I was able to drink so much more this way and I didn’t spill water/powerade ALL over myself like usual. Next time I will cut my straw to 3/4ths the length of a normal straw because I ended up just bringing the short one and it was just a little too short. I stashed it right here for a lot of the race and sometimes stuck it in my belt too. This was a game changer for me and will really help me to stay hydrated during the marathon. Also, this was my 2nd time wearing goodr glasses during a race (well, only for the last little while on Saturday) and I am so in love with them for running. They do not move at all, they are super cheap for running glasses and fit/feel so good. Here is what the gorgeous medal looked like. Also, in the finishing area they had a nice mister/sprinkler to go under and they also had one of those at around mile 12. Thank you Andrew for being there. I did the kid part to go spectate his PR 1/2 marathon last month and it is pretty much just as hard as running the race to get the kids up and fed and out the door to the race to see me at mile 9 and then be at the finish too. He is so incredibly supportive. He also completely took over Skye night duty the two nights before the race so I could sleep like a champ. I got to meet Krystina after the race. Her little boy is just about a month older than Skye and she is training for Chicago this fall. They had cold wet towels at the finish line along with muffins, fruit, chocolate milk, popsicles and water. Last year they had pizza and I think the switch to muffins is much better (I love pizza but I just can’t handle it at 8 in the morning after running). 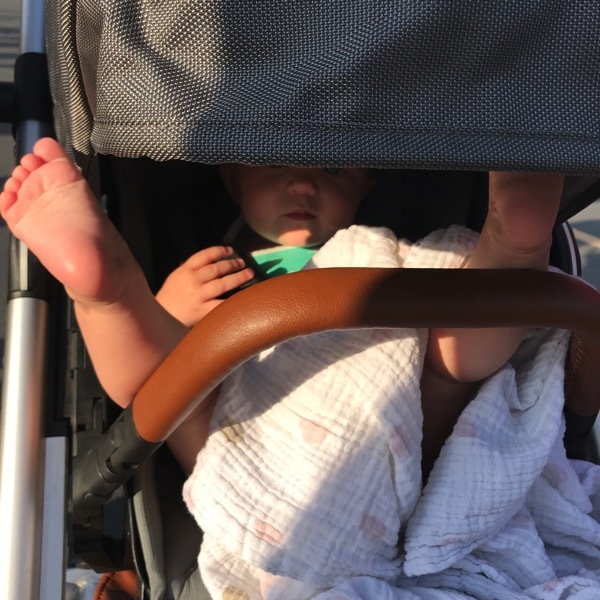 For some reason Skye loves to just kick back and put her feet up in the stroller… it looked quite comfortable to me. 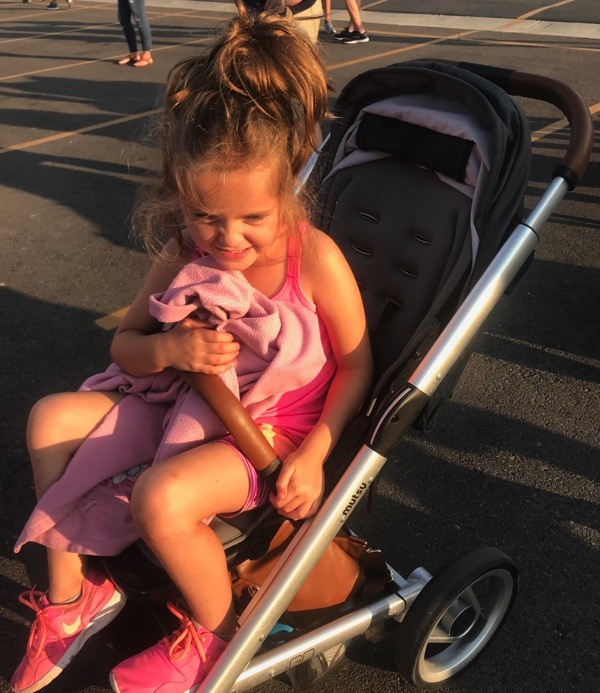 Brooke got in some stroller time too… races are tiring! I think the key thing that I realized Saturday as I’m coming back after having Skye and training for my first postpartum marathon—> I am really enjoying the process. Whatever the times are don’t really matter compared to how much I am loving this. I am loving the time I get all to myself to just focus on me so I can help out the kids and Andrew the rest of the day. I am loving the hurt of those speed days and the ease of the easy days. I am loving the podcasts I get to listen to and the quiet mornings alone while everyone is asleep. I love competing with myself. I am loving feeling stronger and stronger each week and I am especially loving running with my hormones back to normal. I am loving having my cheering crew grow and showing these kiddos that we just can’t quit… We just gotta pump our arms harder when we get tired and think about the things that don’t hurt (aka gratitude) instead of the things that do hurt. Thanks for being my internet friend. I am cheering you on with all of your training too (please tell me all about it)! Has anyone ever slept in on accident on race day? -I have dreams all night long before a race that I am going to! 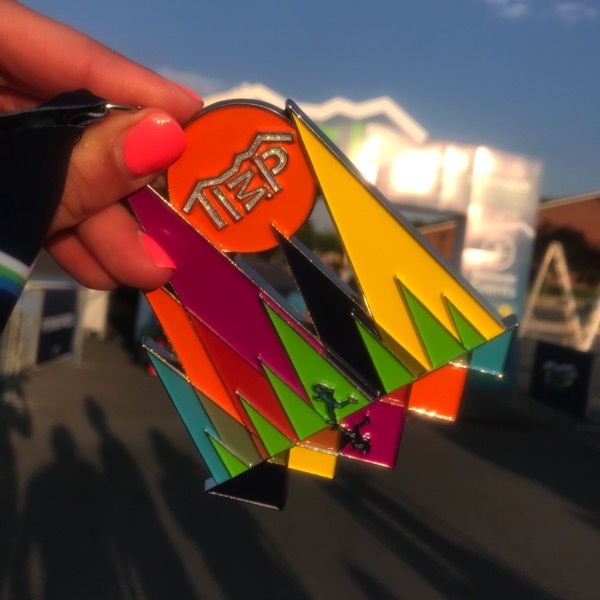 Have you ever paced a race? I really want to try it out!! 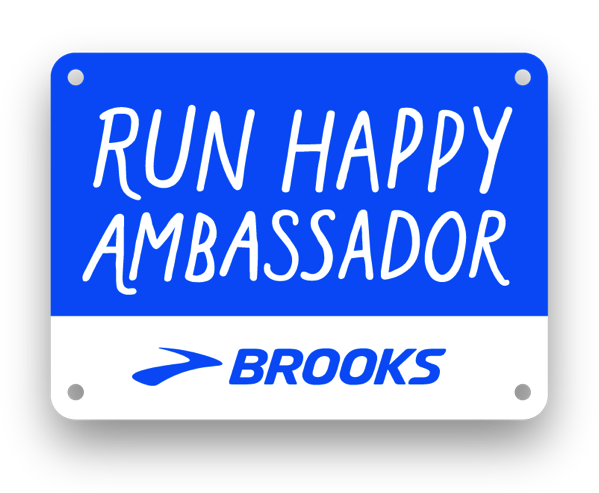 Do you enjoy running with the pacers during your races? What fuel have you been using during long runs and races? What are you loving about your training and the process right now? Rock ‘n’ Roll Las Vegas: Post-injury PR. Congratulations on crushing your goals!! You’re awesome! I just reread your comment 3 times. It was beautiful. I absolutely could not agree with you any more. This is why we truly love the sport and this is something I will always be grateful towards running for. Thank you Kaytlin. PS I love the Kristin quote on your blog and I would LOVE to be able to train together (aka me chase after YOU). Have a wonderful week! She really is. Her book is one of my favorite books ever. I need to copy you and read her old blog posts before races. Thank you so much, that means a lot and I am cheering YOU on from Utah! I think one thing that I’m loving about training right now is challenging myself and pushing through the parts that hurt. I think that running is so comparable to life and having to endure the trials we face. During tempos and speed work, I always tell myself that it’s just a mile of my life or just whatever distance of my life, and I can surely endure it, because it’s not that far in the grand scheme of things. We face trials in life that hurt and that are uncomfortable, but if we just push through them, we come out stronger in the end. Natalie, thank you for always being so good to me and I hope I cheer you on the same way you do to me! YES YES YES… it really is just like life and you are so strong mentally in running and in life. I love it. You know you can push through anything and everything. Have a beautiful Monday! NAILED IT! What an accomplishment!! Good work and amazing job! Love the notes about nutrition / hydration. Humas are my fave too— they don’t make me thirsty like the others and they provide such amazing fuel. Congratulations and I’m so happy you had such a wonderful race!!! You’ve been putting in such good training!! So glad running is so strong and good in your life again!! Thank you so much… honestly you have given me so much encouragement and inspiration just through your comments so thank you for doing that for me. I hope your Monday is a great one! Wow, thank you so much Cara for saying all of that. It means a lot to me. Have an amazing Monday and keep me updated with all of the amazing things you are doing! That is an awesome time and you forgot to mention you WON your age group!!!!!!! Yay! What was the schwag? Thank you so much Tonya! So I didn’t know I took first until that night so I need to email them to see if I won anything. Have an amazing day! 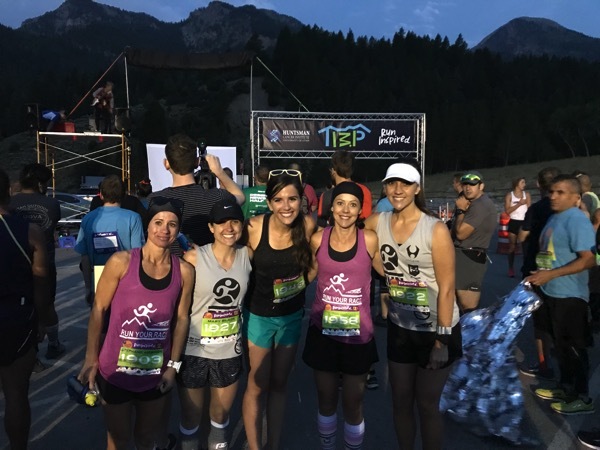 Thanks for this race recap Janae! I’m currently 7 months pregnant with my first baby (a boy we’re calling Skye) and I’ve been put on “very little walking” rest by my Dr, which means no more running :( and i miss it terribly! Looking forward to my first postpartum race! BEST NAME EVER and you are so close. I am beyond excited fro you. I am so sorry that you can’t run anymore. This break from running will make you stronger than ever next year for those first postpartum races. You are doing an amazing job growing a healthy baby and please keep me posted. If you ever pace a race then ummm definitely let us know because I am 1000% signing up for that one! Ha. I ran with a pace group at my PR half for about half of the race, but I felt super strong, so I went ahead at around mile 7. I think they sped up eventually too because they were planning negative splits, but I still ended up running below my goal time! Woohoo! But the pace group was definitely helpful for keeping me from going out too fast I think. I told the guys who were leading it that I was shooting for a PR and they were super supportive/encouraging that I was looking strong. I also dream that I am late to races all the time! Thankfully it hasn’t actually happened yet… :) When I’m training for a big race I also have a lot of dreams that I get lost/miss a turn on the course. My husband just laughs at me, but it’s scary! As far as training right now…I’m 38 weeks pregnant this week so it’s more just getting in a few sloooow miles whenever my husband is free to chaperone me! Lol. My baby is persistently breech so it looks like I’m going to have to have a C-section, sadly. I’m pretty bummed, especially because I know it will take longer to get back into running. But I’m SO excited to meet this little girl, no matter how that happens, and I know someday I’ll be back at it shooting for a PR race again! I can’t WAIT for that fast running feeling again! I miss it so much, I swear this whole process is going to make me so much stronger when I come back because I’ll be so grateful for GETTING to push into that pace where it burns. 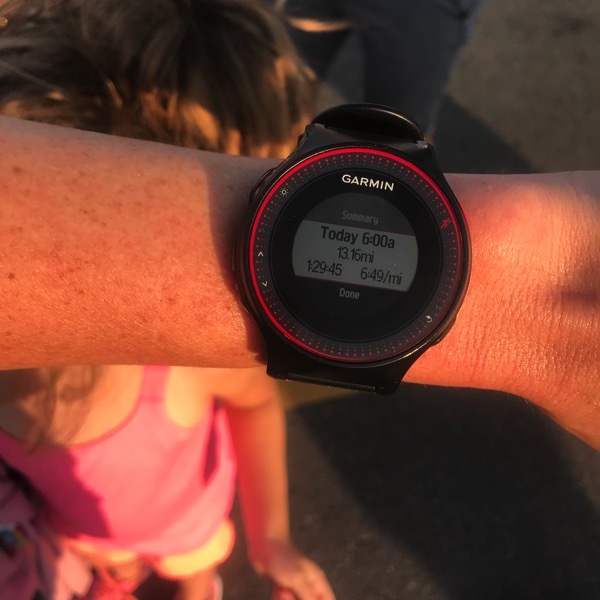 And lastly…this comment is getting really long but did you see the article on runner’s world about the mom who broke the world record for a half while pushing a TRIPLE stroller?! She ran a sub-90! Amazing! Thank you so much Kelly! I will definitely let you know if I pace a race because how amazing would that be to all run together. That is so awesome to hear that the pace group was able to help you so much during your PR half. Runners are the best. 38 weeks–> AHHH I am so so excited for you. I am so sorry that your little girl is breech. You are in my prayers that the c-section and recovery go as well as possible. I personally think that it has made me stronger (having these two girls) so I know it will for you too. Congrats on a great race!! I also use Huma gels and love them. They are the only ones that don’t make my stomach feel sick, but I do sip on them for almost a mile each time. I just can’t seem to get myself to take the whole thing at once. I agree that having family there is so awesome! My family surprised me at Grandmas Marathon last month, and gave me just the push I needed to finally go sub 3:30. Best motivation ever! Enjoy your week! YAY for another Huma lover. They are SO good. DO you have a favorite flavor? HUGE CONGRATS on your amazing marathon last month. So cool that your family was there. I am really thinking about Grandmas next year… give me all of your best pointers whenever you get a chance! Have a wonderful day! Awesome race! I loved reading your race report. 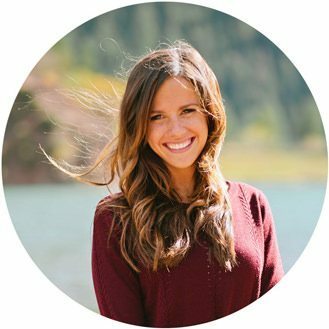 I also loved the end of your post about gratitude. After being out off and on for the last year or so with PF, I’m finally back into running regularly….and I SO appreciate and enjoy every run, even the tough ones (they make me feel strong). GRATITUDE!! Thank you Cindy! I am SO sorry about the struggle you have had with PF over the last year. That is not fun. You are coming back stronger and more grateful than ever. Have a wonderful day! Just saw Morgan Valley – small race, easy logistics, and no time limit for the full! Since I don’t train at altitude, thinking I’d need to get in a few days prior and get acclimated…..
HEY TRICIA!! Thank you so much. You have me wanting more pairs of goodr so I can match different outfits. Ummm 6 hour race in the heat and humidity of St. Louis… WOW!!! Please tell me all about it. Yay for coming to Utah and Marathon Maniac= you impress me again! 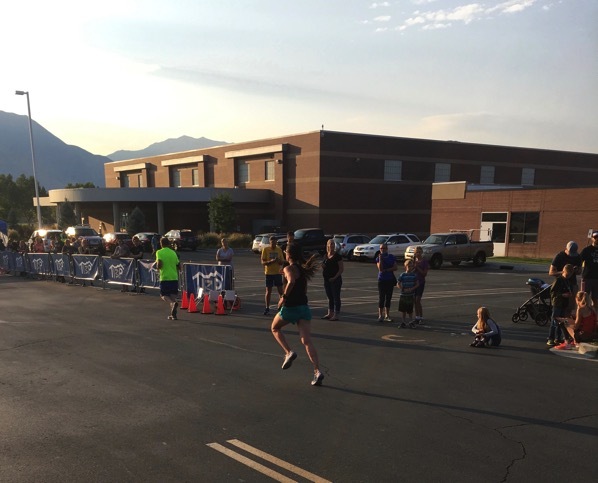 I have never tried Morgan Valley but Utah Valley Marathon in June is UNREAL. It is so incredible! Let me know if you end up doing that one and I’ll be out to cheer for you on the course! That is that 6 hr race you featured me in years ago – 95 degrees or something – haha – I’m trying to forget, because it’s likely to be that again (WITH humidity!!) Right now I am in Ft Walton Beach FL on vacation, so good heat/humidity training, too, did 12 easy today in ‘feels like 89’ :P . Utah Valley looks so pretty and fun EXCEPT that ‘board the bus at 3:15-4:15am’ part!!!! ACKKK that would kill me…. OH YES!!! Seriously, you are incredible! Enjoy the vacation and you are my hero for running 12 miles in that! Hahah yeah that is the tricky part but the views make it worth it:) Keep me updated! Congratulations on an awesome race!! Thanks for sharing a part of your journey with us. Reading about your training has been super inspirational! My “training” has involved starting from scratch after a ton of setbacks. I’m super excited to just get back to a 5k and keep going until I reach my marathon goal! I like what you said about just pumping your arms faster and practicing gratitude when things get hard. Definitely a great life lesson! Thanks so much Susan. You are going to come back so so strong after all of these setbacks… you are going to hit that marathon goal and I want to hear all about it along the way. Thanks Susan! Ooooh I love love love the Pure Cadence! They are go-to marathon shoe! I’m currently training for Marine Corps Marathon! This training cycle I have decided to train with a running coach. I’m a night shift nurse so I love having someone else make my training plan for me! I just run what I’m told to do! Also, I love the Huma gels, and I just started using Untapped…amazing! Way to rock your half!! AHHH I am so excited for you to run Marine Corps, that is on my bucket list! You’ll have to keep me updated with everything. You are my inspiration… I can’t imagine training for a marathon and working the night shift. Wow. You are incredible. I am going to have to find out what Untapped is. Thanks Missy! I will have to let you know how much I love MCM! I wasn’t going to run it, ya know…my last 8 marathons were going to be my last! I have a few more bucket list runs to do, though! Oh training while working night shift is a whole different beast! It’s so tough! But really, I’ve trained for all of my marathons while working nights! You are my inspiration for running and raising babes!! Every mother runner has my respect! Yes! Look up Untapped fuel! It’s been decent to my stomach so far! You are amazing, Janae!!! I love following you! You’re such a positive inspiration to us!! Hahaha ‘my last 8 marathons were going to be my last!’ … I love it! Seriously, when I am tired and not wanting to get out and train I will remind myself that YOU are and you worked the night shift. Thank you Missy! Keep me updated on everything and have a great night! I don’t pay a lot of attention to the pacers just because I think it messes with my mental game. I feel like if I’m running ahead of a certain pace, I’m going to crash. And if I’m running behind them at all, i feel like I’m not making my goal. So I try to just ignore them for the most part and listen to my body instead. And I agree, muffins are way better than pizza right after a race. Once I ran a race that had chips and salsa after and I love that but I couldn’t get myself to even grab some because it just didn’t sound good. That totally makes sense to me! You keep doing what is right for you! Salsa… yeah, I definitely could not eat that post race haha! Have an amazing day Jenny! I want to hear mire about drinking water with a straw. That still sounds hard to do while running fast and storing the straw sounds like a nuisance but you thought it worked? HEY MARY!!! Great questions. So my number one favorite option for drinking would be for someone to hand me a water bottle to drink from and then everything else is pretty inconvenient ha. I guess it definitely was a bit of a nuisance to carry it and get it ready while running fast BUT I was able to get in a lot more water/powerade this way vs just drinking from the cup (because 90% of it would just spill out all over me). I think with more practice I’ll get better and better at it but overall it wasn’t that bad and the benefit of being able to drink a lot more outweighed any problems of bringing it with me. I hope that makes sense. You ran fast and it wasn’t even a race for you! Do you wish you had raced it to see how fast you’d go? 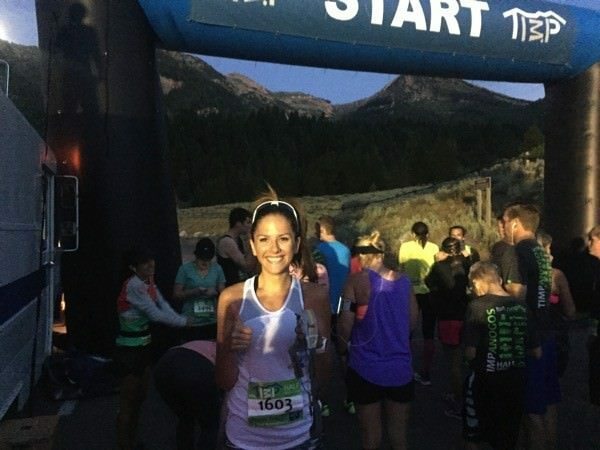 Will you race a half before the marathon? Hey Mary!! SO going into it I really wanted to race it but my coach wanted me to do it as a workout so I trusted her:) I am happy with how that went so that I can jump back into workouts without having to take a bunch of time to recover. I’m not sure if I will be this time but I’ll ask my coach:) Thanks Mary and I hope you have an amazing day! GOOD CALL on the treadmill… I don’t know how anyone could run in that crazy heat. Please keep me updated with all of your training, I am so excited for you! Congrats!!! I live in Cedar Hills and KNOW the sprinklers of which you speak! They are the worst!!! I even asked the city to post their watering schedule so I could avoid them during my own runs, but there is no avoiding them because that is how I get to the Murdock Canal Trail, and they are always going during the days/times I run… :) Sounds like you had a stellar race! AHHHH YOU KNOW…. they are crazy ha. I almost had to laugh because it was so ridiculous getting slammed in my face by them while trying to do an interval:) I hope the city listens to you and posts them. Oh I LOVE the Murdock. We are so lucky to have so many good places to run here. Have a wonderful day Michele! GIRL. You totally rocked this! Going under 1:30 for a workout is amazing and was such a good idea too, because 4 X 2 miles is a LONG workout. It’s fun to use races as workouts sometimes. Those are definitely some of my very best workouts because I am a lot more motivated during races than I ever am for workouts. The straw idea is really good. I absolutely love the Huma gels as well. I am not a fan of most other gels, but the Huma ones seems to work well for me (I like the strawberry lemonade one). I still can’t decide whether I want to train for a fall marathon (it would be late fall at this point) or whether I just want to make focus on the half and shorter for a little while and maybe wait to do Boston 2019. I don’t know, but like you, I really just LOVE the process. I don’t have to have a big race on the calendar to be motivated. I just love the training! Keep up the good work and I can’t wait to follow along w/ the rest of your marathon training cycle! SAM… I look at your workouts and I am beyond amazed by everything that you are doing. Do you always use Huma during races or do you use something other than gels. I wish I could train with you so bad (aka chase after you). That is such a tough decision, either way I can’t wait to see you smash Boston next year. Keep me updated with everything… I think you are amazing! Oh man. I wish we could train together too. That would be amazing. I’m pretty sure at the rate you are going, you are going to have made a full postpartum comeback and will have passed me by before I even finish typing this comment. You’re running so strong! I also use UCAN before my long runs and marathons. I use the kind that has protein in it and it stays with you for a while. I don’t usually take a gel until after the half way point because the UCAN will stay with you for up to 2 hours. I try to take the gel before that point just to be safe. I don’t feel like I have this totally nailed down though. The fueling thing is always a work in progress when it comes to the marathon! Congratulations!!! You look RIPPED so strong in those pictures. I love love love what you said about running for yourself and enjoying the process. Also you would be an amazing pacer, you definitely should! Oh thank you Krista!! I really want to try out pacing… I think it would be awesome. I hope you have a wonderful day and keep me updated on everything that you are doing! My daughter sits the same way when she’s in the jogging stroller. Yesterday we went out for 4 miles. Around 1.5 miles in I see her little feet up so I looked in on her and she was asleep. She slept the rest of the run and only woke up when we got back home. I guess she loves being pushed up the hills that I hate so much! HAHA oh I love this!! It must be so comfortable for them:) You are SO strong pushing her up hills in the jogging stroller, I only push Skye on the flattest surfaces possible. It’s so hard! 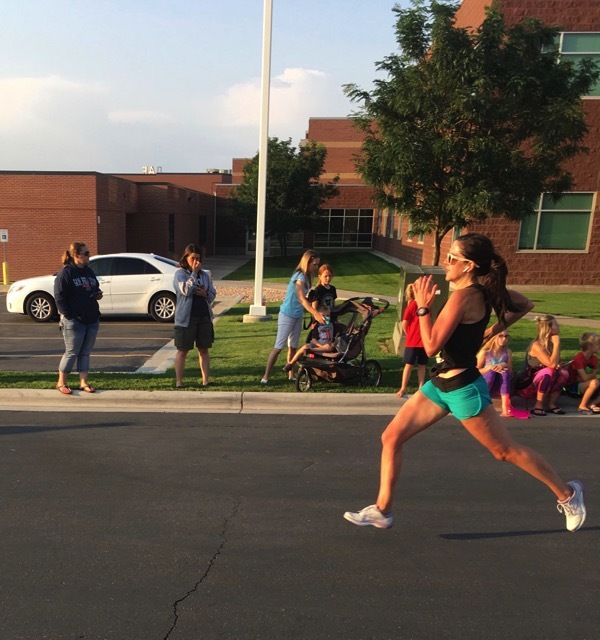 Your comments about post partum running really inspired me today. 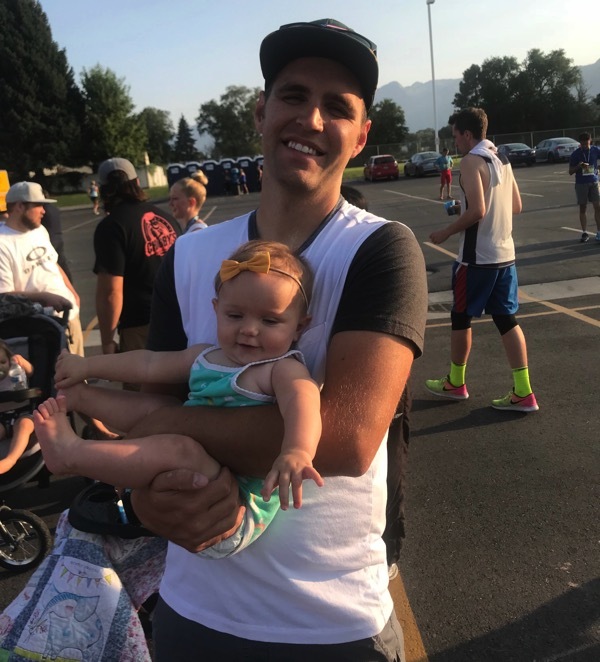 I had my first baby two months ago and in the midst of sleep deprivation and excitement to start exercising again, I signed up for about 3 races. I was starting to dread running because I feel like I can’t run as fast as before. Now instead of focusing so intently on times, pace, fuel, etc, I’m really going to focusing on enjoying the me time. Thanks!! CONGRATS MARY!!!! Your little one is so lucky to have you:) Yes, enjoy the me time… take in every single minute because it will help you with the rest of the day. And… I can honestly say, I am feeling stronger lately than I did before having Skye. It definitely takes time and patience but be gentle with yourself because you will sleep again and you will feel good again. Hey! This is mildly unrelated but would you mind telling me about the pain you had in your foot from sleeping on your stomach? I swear i have the same thing but I can’t remember what you said about it…. Thanks!! HEY ELEANOR!!! I am so sorry about the pain you are experiencing. For me it was my plantar fasciitis that was bugging me whenever I slept on my stomach. My heal felt so tender and a little painful and my whole foot just felt like it was so tight all day long. Try out sleeping a different way and see if it helps and if you do have plantar, these are what I sleep in when it gets bad and it helps so much! Amazing job! You’re my inspiration:) I was just debating what to do about fuel while training/racing (first race in 4 years!) so this post was really helpful. Good luck in St George and I can’t comment without saying your family is beautiful!! I am so glad that this post was able to help you out. What race are you doing? I want to hear all about it. Thank you so much and I hope you have a wonderful day! Just a Half in Marquette, MI (in the “UP” (Upper Peninsula of MI)). Gorgeous race that’s mostly downhill! Perfect for coming back to racing, haha! Thanks for sharing all your running info (and recipes, kid/family stuff and fun stuff😄). That sounds like an amazing race! I want to come do that:) Thank YOU Nikki and please let me know how it goes! CONGRATULATIONS ASHLEY!! I am so excited for your first little one to arrive. I am also so excited for your first postpartum race too. Huge congrats on all of the hard work you are doing to grow this baby and you are going to come back so strong. Have a wonderful day! Congratulations on an AWESOME race!!! So happy for you – you did AWESOME!!!!! I LOVED reading about it!!!! Thank you so much Sara, I really appreciate you! I hope you have the most wonderful day! You are so great and I’m beyond happy to know you (via Internet)! 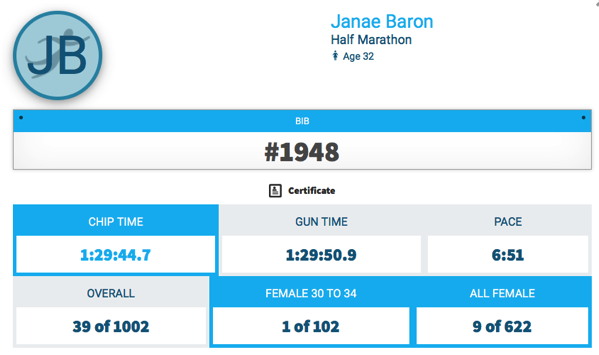 Congratulations on an awesome race/speed workout, Janae! You are such a motivation and inspiration to me! I’m 32 weeks pregnant with my second child and I can’t wait to get back into shape after I have my baby! Watching you do it correctly has been awesome. You are just amazing! P.S. That finish line chocolate milk looks AMAZING! All the work, hard and easy –> go to whisper voice (sub-3, sub-3, sub-3, here she comes in a couple mos)!!! You can do it. You can do so much!!! Your comment gave me the biggest smile. No more whisper voice… say it loud haha! Have a wonderful day Lee! Congrats on your race! Sounds like you are chipping away at marathon training. Haha we do a triathlon that finishes at about 8 am that has pizza in July and I always eat it at 8 am. It feels weird, but it’s pizza. Thank you Victoria!!! Hahah teach me to love pizza so early in the morning. I was so bummed for you that you didn’t get your ice cream during your long ride this weekend! AHHHHHHHH how rude was it for them to not be open at 10 am? Doesn’t everybody want ice cream at 10 am? Congratulations on a great race, Janae! You are going to get that sub-3! Oh thank you Kelly! That means a lot to me. I hope your Monday is amazing! CONGRATS on such an amazing race! I have a half coming up in two weeks as part of training for the Twin Cities Marathon, which reminds me that I should probably pick up more fuel soon – I’ve used Huma gels for years, but have been trying Sport Beans for marathon training since they’re cheaper and I’m liking eating something more food-like on long runs. However, it’s hard for me to chew and run at the same time so I might need some Humas for my half so I don’t need to take a walk break to eat. I’m almost halfway through training for my first marathon, so it’s getting to the point where the long runs are getting LONG for me! 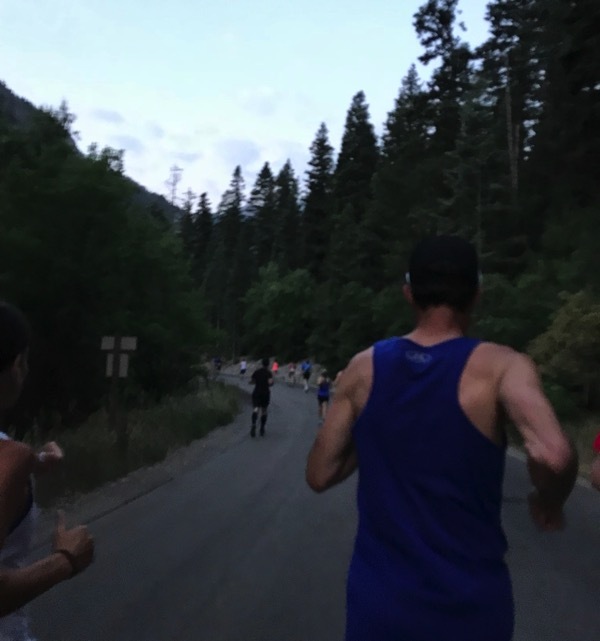 I’m feeling much better at this point than I ever expected to, and I’m trying to embrace the fear and apprehension about “the next long run” since there’s only so many times you get to experience those new distances for the first time. I can still remember reaching 4 miles for the first time ever, and this weekend I almost quadrupled that experience with a 15 miler! Congrats ! Both for your amazing time and for staying focused in your training run, that’s hard when people around are racing. There should be tshirts with “this is a training run, don’t let/make me race you” :p.
My favorite fuel is Tailwind, I carry a big bottle with it, but I m thinking I need to find something else for long runs with others, I get too excited and distracted that I forget to take small sips of it, I always end up getting only half of the calories I would if I was running by myself. Have an excellent week. I love your blog, thank you for sharing. You seriously inspire me every single day!! Thank you for sharing your life with us – congratulations on an awesome race! So proud of you!!! Sounds like you had an awesome race! Great job! I love that you are so excited about your training! I think the thing I love the most about my training right now is that I am feeling so capable of tackling the challenges. I have a few low mileage weeks due to vacation and some other life stuff, but this Saturday I got in a long run after 3 weeks off and did 10 miles. It was hard the last mile (probably because I didn’t really know where I was or how far away my car was) but after I finished I felt accomplished and not exhausted. I was worried that I wouldn’t be able to go back to such high mileage without some build up but it has me pumped up to keep running and challenging myself! 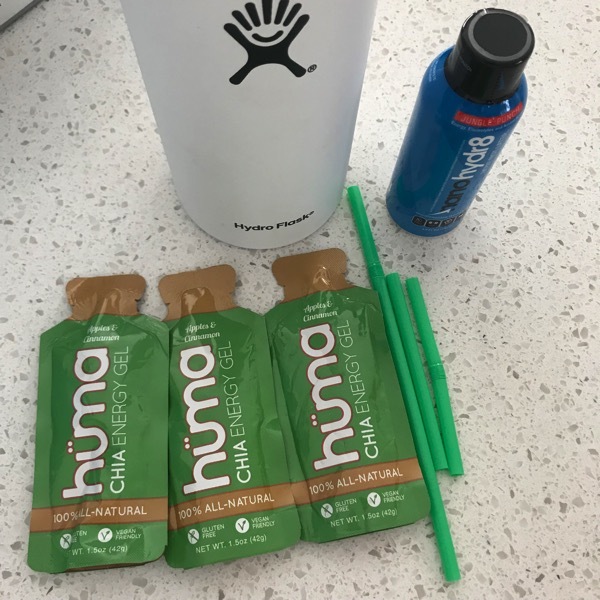 Also, I tried the huma gels after you wrote about them and have been using them for a couple months now for my long runs and they are really great for me too!!! 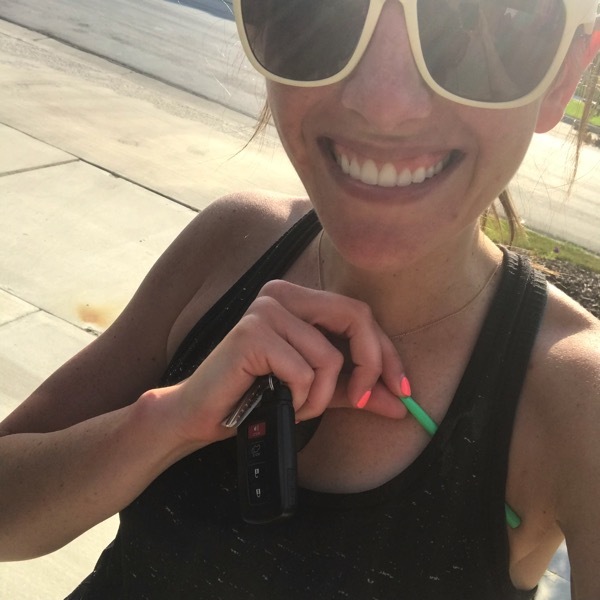 :) Since I have never run so many long miles so consistently I was worried about fuel and doing it wrong but your posts about it have really helped me figure out some good tips to follow for myself! So thanks for sharing what you are trying! Congrats!! What an amazing accomplishment, I can’t even imagine how good that feels! Thanks for the daily inspiration 😊 I don’t comment much but I love reading your blog every morning! You are SO speedy!! Congrats on your time. I started following you a couple months ago, you are an inspiration. I am training for my 3rd marathon Big Bear in CA. I am excited and nervous because this is my first time going into a marathon with a time goal. 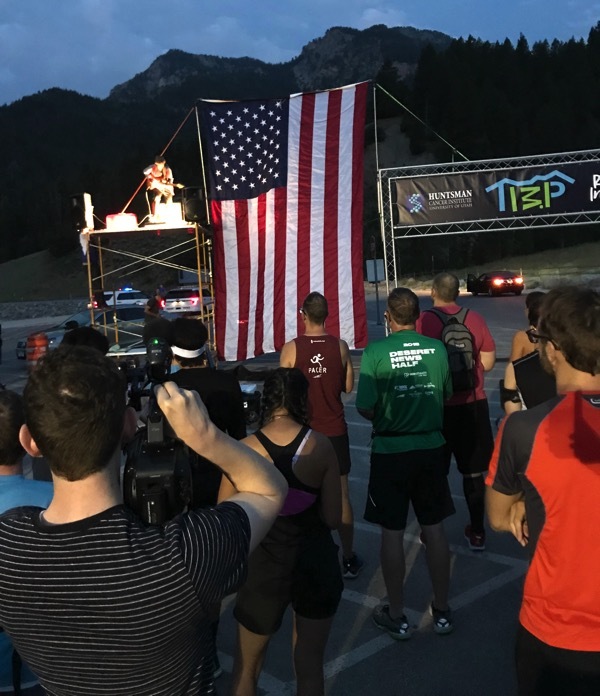 My last marathon was Big Cottonwood 2 years ago and I finished at 4:06. Since then I am a lot faster (I ran Drop13 @ 1:43), so my goals are A) BQ (I need a 3:45, so I want 3:40 to actually be able to run it) B) 3:50 or C) a sub 4 hour marathon. So far training is going well so I am hopeful. I love the HUMA gels, I started using them this year and they have been a real game changer for me and stomach issues. One step closer to making those dreams a reality! It was awesome to see you in action:). Enjoy the recovery! Congratulations!!! That’s a super good time! My favorite/only fuel I’ve used- Peanut Butter M&Ms. I’m pretty sure I just use running as an excuse to eat candy. totally know what you mean about the shoelace coming undone in a race and having to double knot. it’s terrible when it comes undone! i’ve never slept in on race day by mistake. i’ve always get up early or exactly on time…! thanks for the report on using the straw on the course and everything else. learning so much from your experiences! Now rest up and eat up and get ready for that marathon, girl! Such a great post!! You are amazing and inspiring. I am training right now for my first marathon and you are keeping the positive vibes flowing for me thanks lady!!! Have a great day! I usually have a hard time sleeping because of nerves/anxiety so I’ve never slept in on accident on a race day, but man, that would be terrible! I’ve never been a pacer (I don’t think I’m quite experienced enough) but I have used pacers for 2 half marathons and I liked it. It was nice to have someone to focus on rather than thinking OMG OMG I’M DYING lol. You. Are. Amazing! Congratulations on a great workout race! I just switched my training focus from triathlon to my half marathon in September so my body is a little confused right now haha. I just have to say that The Huntsman Cancer Institite doctors are the ones who finally diagnosed my Mom’s primary cancer location. Tomorrow will be 17 years since she passed away, but the doctors and staff there were simply amazing!! I hope you are still savoring your success of this half and that it carries you through the week with a huge smile! Thank you for sharing this with me Dawn. I am so sorry that you lost your mom and I hope tomorrow that you feel of her love and comfort. Thinking about you! Thank you ♥️ I may have to add this race to my schedule for next year in Mom’s memory! Love that you rocked this course! You crushed it!!! Congratulations! You’re such an inspiration. I love how you always keep things in perspective. 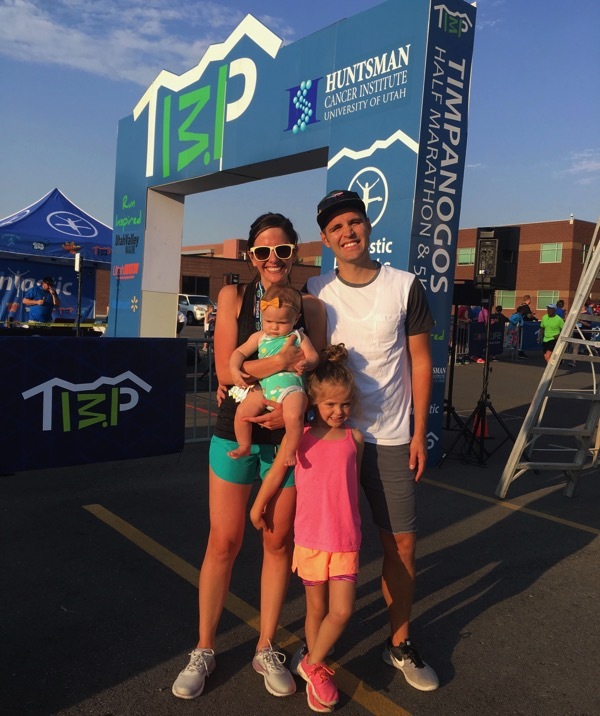 You’re clearly a very talented runner; yet, your love for your family, your faith, and your gratitude for all that life has to offer beyond running are what keep me coming back for more (and I really don’t regularly read any blogs other than yours anymore!). Now go celebrate an amazing run and eat some donuts! You are amazing!! So speedy! Love the picture of Brooke greeting you! 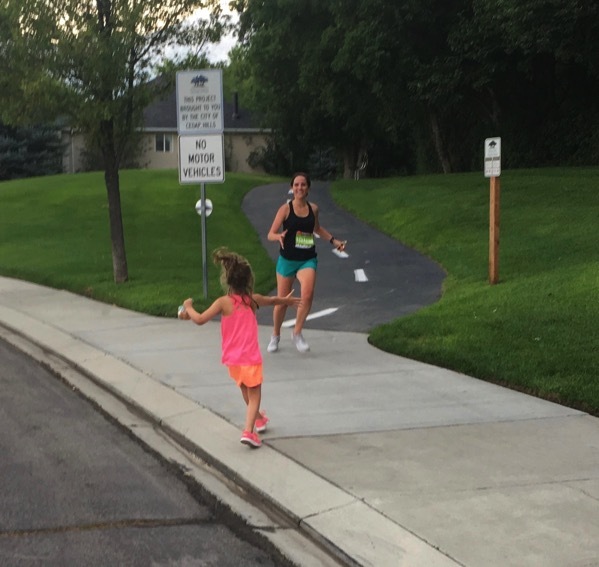 Nothing makes me happier than seeing my kids when I am running a race. It is the best feeling! 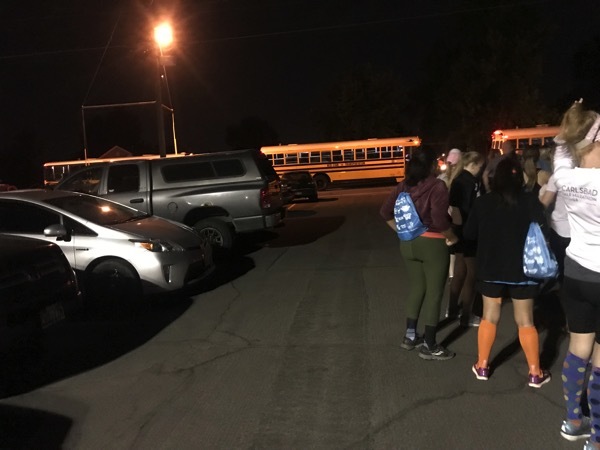 I got to be a pacer for the first time in September, and it was amazing! I spent the entire race trying to think of ways to district the ladies around me from the pain that comes with pushing yourself for 2+ hours (it was a half marathon). I also made sure to get the crowd involved by saying things like “look at these amazing women and what awesome things they are accomplishing this morning!” It was an honor and privilege to be able to witness people achieve the goals they had spent weeks working towards. It was also a little stressful, because I didn’t want to end up finishing over the goal time, but it all worked out. I had one lady stick with me until almost the end, until she kicked it down and finished ahead of me. I was so proud and excited for her!!! It was a powerful experience!! Well the straw thing is absoilteuy GENIUS and I will be stealing that idea for all my upcoming races! Janae I am loving being a part of your blog post!!! What an honor : ) seriously though, you are amazing and way to crush this race! I always love reading your race recaps. I think every time I sign up for a race I think “what if I miss my alarms! ?” Haha. Humma sounds good, I need a break from gu’s. It was so fun to meet and chat with you after the race! Sub-90 minutes, that’s so awesome! That is my next goal. I am going to break that 1:30 barrier! And I agree, those sprinklers were insane. Have you tried Vfuel? Those gels really work for me – I need to give Huma gels a try too. I set like 4 alarms b/c my biggest fear is oversleeping and missing my race. Wow! That is awesome, congrats!! 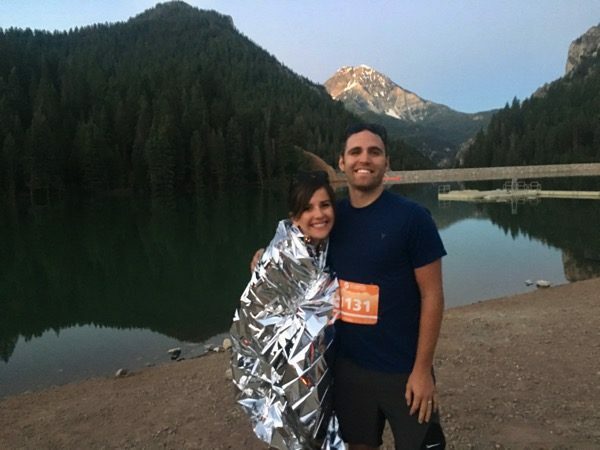 My roommate and I are currently training for a half marathon and neither of us have ever ran one before so this post and your blog is such an inspiration. I took notes of some of the things you did to help you so maybe that will help us as we get closer to our race.